Rewa midfielder Madhavan Goundar sent thousands of Labasa fans disappointed when he scored the winning penalty to give his side a sweet victory in the first semi-final of the 2017 Vodafone Fiji FACT at Ratu Cakobau Park in Nausori last Saturday. As expected, the match proved to be a thriller with both teams displaying fast paced and constructive football in front of a sold out crowd. The Delta Tigers were more in possession and in the 37th minute of play midfielder Taione Kerevanua netted the opener after tapping in Samuela Kautoga’s attempt on goal which was palmed away by goalkeeper Akuila Mateisuva. Rewa led 1-0 at halftime. The second half started and again Rewa kept the pressure on the Labasa defense but failed to capitalize on its chances as Kautoga, Iosefo Verevou, Gabirielli Matanisiga and Tevita Waranaivalu missed golden chances in front of the goal. The Labasa fans had something to cheer when midfielder Christopher Wasasala leveled scores for the Babasiga Lions in injury time after his deep cross from the left hand corner was misjudged by goalkeeper Simione Tamanisau and landed into the roof of the net. The teams failed to score any further goals in extra time and the winner had to be decided by penalty shoot-out, where goalkeepers Tamanisau and Mateisuva gave their all and made crucial saves. Captains Antonio Tuivuna and Lorima Dau attempts were saved by the goalkeepers. 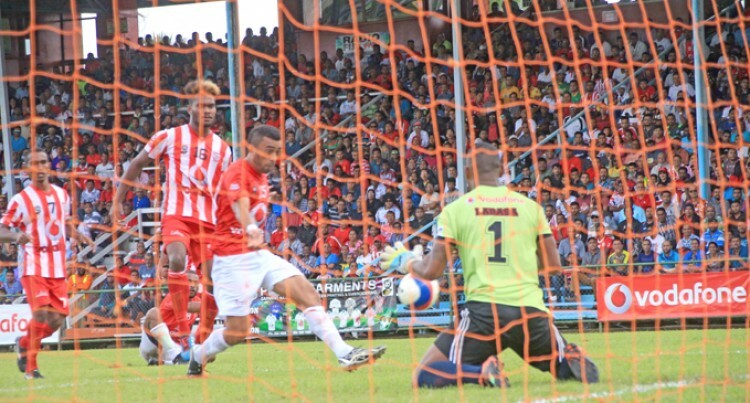 Lekima Gonerau put Labasa up 2-1 with his attempt while Mateisuva saved Verevou’s attempt. Mateisuva put Labasa up by 3-1 and Kerevanua kept Rewa in contention by placing his attempt at the back of the net. Manasa Levaci scored from Labasa’s fourth kick while Amani Makoe scored from his attempt for Rewa. Tamanisau saved a crucial penalty from Edwin Sahayam and Vuniuci Tikomaimereke leveled the scores 4-4 with Rewa’s fifth kick. Akeimi Ralulu and Tevita Waranaivalu’s attempts were saved by the keepers while Leone Damudamu and Matanisiga found the net as the scores remained level at 5-5. The winner had to be decided by the eighth kickers and Tamanisau brilliantly saved Ilisoni Loloivalu’s attempt and Goundar made no mistake with his attempt as he blasted the ball into the back of the net to send the Rewa fans into frenzy while Labasa fans walked out of the park disappointed. The teams: Labasa- Akuila Mateisuva, Nickel Chand, Edwin Sahayam, Anish Khem (Jonetani Buksh), Lekima Gonerau, Christopher Wasasala (Akeimi Ralulu), Ilisoni Loloivalu, Manasa Levaci, Ratu Apenisa Anare, Antonio Tuivuna (C), Taniela Waqa (Leone Damudamu). Rewa- Simione Tamanisau, Peniame Drova, Lorima Dau (C), Vuniuci Tikomaimereke, Iosefo Verevou, Gabiriele Matanisiga, Madhavan Goundar, Tevita Waranaivalu, Taione Kerevanua, Amani Makoe, Samuela Kautoga (Sailosi Rayaqona). Referee: Navneet Varman.